Chanteur Rock 'n' Roll et Pop US né le 12 Novembre 1943 à Woodhaven (New York). 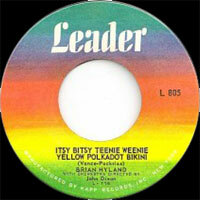 Brian Hyland's puppy-love pop virtually defined the sound and sensibility of bubblegum during the pre-Beatles era. In the years after his teen idol stature faded, he enjoyed a creative renaissance, releasing a series of underrated country-inspired efforts and even making a brief return to the pop charts. 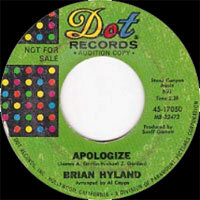 Born November 12, 1943, in Woodhaven, NY, Hyland studied guitar and clarinet while singing in his church choir. At 14 he co-founded a harmony group dubbed the Delfis, which cut a demo they shopped to various New York City record labels. 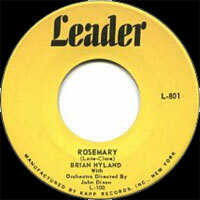 Hyland ultimately signed as a solo artist to Kapp Records, and in late 1959 issued his debut single, "Rosemary." 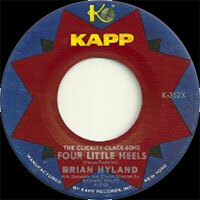 For the follow-up, "Four Little Heels (The Clickety Clack Song)," the label paired him with the Brill Building songwriting duo of Lee Pockriss and Paul Vance, and when the single proved a minor hit, Pockriss and Vance set to work on the follow-up. 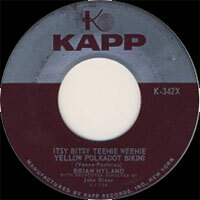 The resulting "Itsy Bitsy Teeny Weenie Yellow Polka Dot Bikini" topped the Billboard pop charts in the summer of 1960, vaulting the 16-year-old to teen heartthrob status. 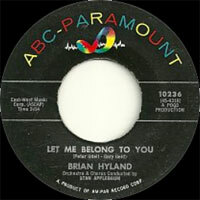 After a move to ABC Records, Hyland partnered with the songwriting and production tandem of Gary Geld and Peter Udell for the hits "Let Me Belong to You" and "I'll Never Stop Wanting You." 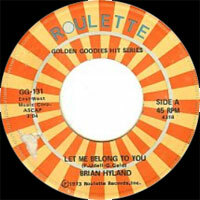 With 1962's "Sealed with a Kiss," a Top Five entry on both sides of the Atlantic, Hyland sealed his reputation as a paragon of youthful innocence and first-kiss romance, perfectly capturing the adolescent zeitgeist in the months leading up to Beatlemania. 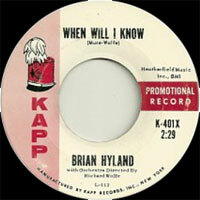 With 1962's Top 30 hit "Warmed-Over Kisses (Leftover Love)," Hyland introduced elements of country music into his sound, an approach he explored on singles including "I May Not Live to See Tomorrow" and "I'm Afraid to Go Home" and culminating with the 1964 LP Country Meets Folk. 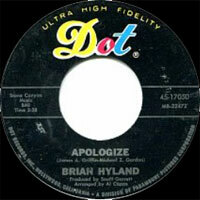 While Hyland's music clearly anticipated the folk-rock and country-rock that would blossom in the years to follow, he seemed hopelessly out of touch in contrast to the British Invasion acts now dominating pop radio, and his commercial fortunes rapidly dwindled. 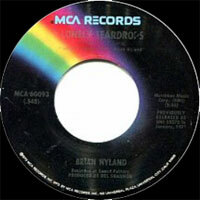 Hyland nevertheless forged on, teaming with producer Snuff Garrett and famed session men J.J. Cale and Leon Russell to score a pair of surprise Top 30 hits, "The Joker Went Wild" and "Run, Run, Look and See." 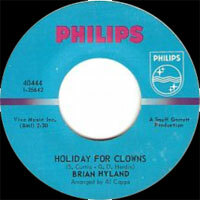 Subsequent efforts including "Get the Message" and "Holiday for Clowns" barely charted, however, and with 1969's Stay and Love Me All Summer, Hyland shifted gears yet again, creating a melancholy yet luminous sunshine pop sound of remarkable maturity. 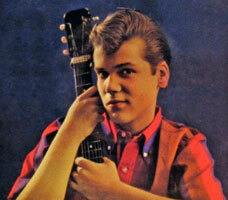 A year later, he resurfaced on the Uni label with a self-titled LP produced by Del Shannon. 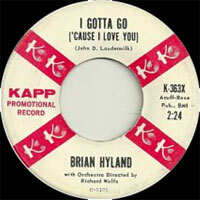 With "Gypsy Woman," a cover of the Impressions' 1961 R&B hit, Hyland scored his final Top Five hit, and while his rendition of Jackie Wilson's "Lonely Teardrops" also proved a minor chart effort, originals like "Mail Order Gun" (written in response to the assassination of John F. Kennedy) failed to earn the attention they deserved. 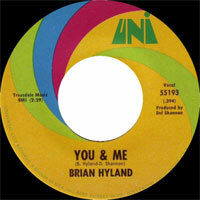 Despite the success of "Gypsy Woman," Uni dropped Hyland from its roster and he spent much of the decade without a record deal, instead touring the U.S. and Europe. In 1975, ABC's British division reissued "Sealed with a Kiss," and it cracked the U.K. Top Ten. 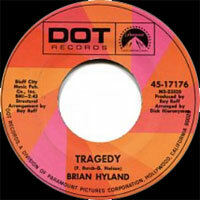 Two years later Hyland and his family settled in New Orleans, and in 1979 the Private Stock label issued In a State of Bayou, which spotlighted his collaboration with the famed Crescent City composer and producer Allen Toussaint. 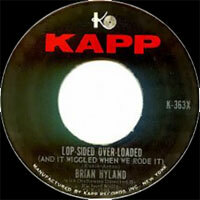 Hyland continued his active touring schedule in the decades to follow, often performing with son Bodi on drums. 02/1960 SP LEADER L 801 (US) . 06/1960 SP LEADER L 805 (US) . 04/1961 SP KAPP K-384x (US) . 05/1961 SP KAPP K-401x (US) . 07/1961 SP ABC 45-10236 (US) . 10/1961 SP KAPP 429x (US) . 1962 SP KAPP K-4013 (US) . 03/1963 SP ABC 45-10427 (US) . 05/1963 SP ABC 45-10452 (US) . 09/1963 SP ABC 45-10494 (US) . 1963 SP PHILIPS 320 034 (GER) . 1963 SP PHILIPS 320 038 (GER) . 03/1964 SP ABC 45-10549 (US) . 08/1964 SP PHILIPS P-40221 (US) . 07/1965 SP PHILIPS P-40306 (US) . 03/1966 SP PHILIPS P-40354 (US) . 06/1966 SP PHILIPS P-40377 (US) . 10/1966 SP PHILIPS P-40405 (US) . Hung Up In Your Eyes / Why Mine? 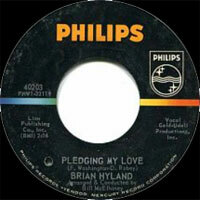 04/1967 SP PHILIPS P-40444 (US) . 07/1967 SP PHILIPS P-40472 (US) . 10/1967 SP DOT 45-17050 (US) . 11/1967 SP DOT 45-17061 (US) . 02/1968 SP DOT 45-17078 (US) . 06/1968 SP DOT 45-17109 (US) . 12/1968 SP DOT 45-17176 (US) . 03/1969 SP DOT 45-17222 (US) . 06/1969 SP DOT 45-17258 (US) . 08/1969 SP DOT 45-17291 (US) . 01/1970 SP UNI 55183 (US) . 06/1970 SP UNI 55240 (US) . 01/1971 SP UNI 55272 (US) . 05/1971 SP UNI 55287 (US) . 09/1971 SP UNI 55306 (US) . 03/1972 SP UNI 55323 (US) . 06/1972 SP UNI 55334 (US) . 1974 SP MCA MCA-60093 (US) .